O'Brien holding the Jilek cup trophy. The Jilek cup is a tournament of the four high school hockey teams in AnnArbor. Coming down to the waning seconds of the game, Skyline Eagles hockey player Shea O’Brien gained possession of the puck. A cluster of engaged and eager fans banged on the glass. O’Brien’s team only needed one goal, and they were counting on him to drop the curtain. The pressure rose and got heavier as seconds ticked off the clock. Unfazed by the raging crowd, O’Brien launched a shot. The puck made its way through traffic, coasted under the goalie’s glove, and grazed the back of the net. It was a goal. His teammates all raced over to him to celebrate, noisy Eagles fans cheered in the bleachers and players sticks clapped on the boards with excitement. O’Brien delivered when he was needed most. After the game, some teammates went to celebrate the win, but O’Brien had already made other plans that night with books, upcoming tests, and studying for the ACT and SAT. O’Brien, a junior, as begun a difficult, busy and stressful college process that takes a lot of free time out of his day. 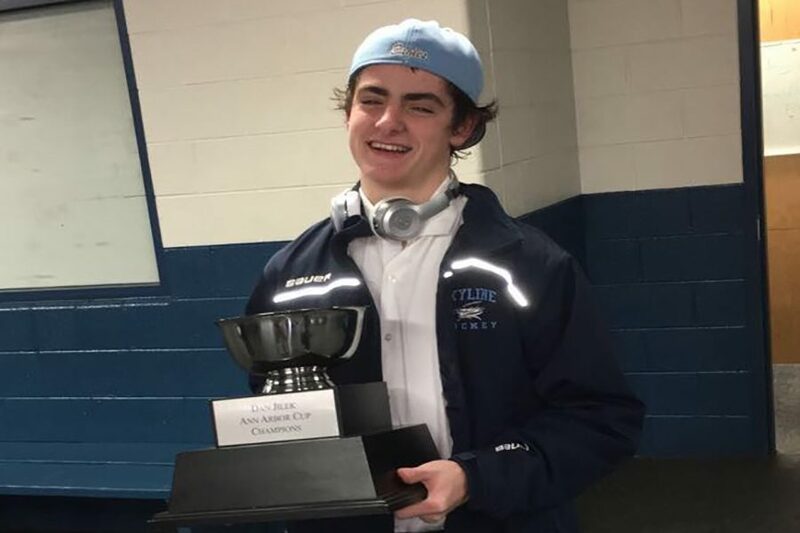 As an athlete of the Skyline hockey and baseball teams, a member of the Depression Awareness Club, and a member of the Forum Council Committee his days are already pretty hectic. Adding the college process on top of all that makes his days even more tiring. Applications, resumes, standardized tests, college essays and transcripts are just some of the work required in this process. And on top of that, finding the right place to spend the next few years of your life. Small school? Big school? Close or far from home? where your family wants you to go? The whole thing is a lot of pressure to put on high schoolers such as O’Brien. It’s easy to get caught up in the future and lose focus. So how does O’Brien handle all the pressure and stay focused? What is his motivation? However, nobody can do everything perfect including O’Brien, so the stress builds up on him very often, and that’s where sports factor in, especially hockey. Despite the cons of the process, there are perks. For O’Brien, It may just be birding or rollerblading down to a U of M class or something small, but those 15 minutes of freedom is something he really enjoys. Aside from all the freedom he gets and is looking forward to next year, there’s so many places to end up, so many different types of schools. To some kids that can be a little disheartening but O’Brien loves the idea of how he could end up at so many different places.